When Lenora LeMaster first went to school, the only English she knew was "OK."
"Whatever the teacher said," LeMaster, 60, laughed, "I would just say, 'OK.'" It fooled the teacher for a little while. Traveling around the remote areas of the rez, you hear stories like this a lot. But we are 15 miles from the large border town of Gallup. How could you grow up in sight of Gallup and not know a word of English? Well, says LeMaster, 15 miles was a lot farther when she was a girl. "We didn't have paved roads or even gravel," LeMaster said. "There wasn't a bridge over the wash."
When it rained and the wash filled up, "the school bus would just turn around at the wash and leave," LeMaster recalled. But her father, Tom Hudson, had never gotten an education and he was determined that all nine of his children would have one. "One by one, he waded across the wash with one of us on his shoulders," remembered LeMaster, tearing up a bit. "We would run from the railroad tracks to Route 66 to catch the bus. Out of the nine of us, eight ended up going to college. "When they made my dad," she said with a smile, "they broke the mold." It wasn't until the mid-1970s that Tsayatoh got a bridge across the wash and graveled roads. Electricity didn't get here until 1986. Pavement finally came in 2009. Tom Hudson didn't quite live to see it. Today, said Walter Hudson, LeMaster's younger brother and the chapter's vice president, 88 percent of Tsayatoh households have running water and electricity. Yet Tsayatoh is a different world from bustling Gallup. "If you look over there," said Terry Bowman, 23, Hudson's and LeMaster's grand-nephew, "you can see I-40. You can even sometimes hear the trains on the track. But it's so peaceful here." Name: Anglicization of Tséyató, Water Under the Rock, in reference to a seep that was used as a water source. It has completely dried up. Land area: 80,000 acres, but only 51,000 are Navajo trust land or Indian allotments. Major clans: Kinyaa'áanii, Tábaahá, Tsé Nahabilnii, Tsi'naajinii. Famous daughter: Former Miss Indian USA Chenoa Bah Stillwell-Jensen. Assets: Frontage on both Highway 264 and I-40, proximity to Gallup. Issues: Flood-prone washes, bad roads, heavy checkerboarding. Bowman grew up mostly in Window Rock, but his roots run deep here. He, LeMaster and Hudson are descendants of one Atsidi Biyé (Silversmith's Son), a founder of the modern community of Tsayatoh. Named for a seep under a sandstone ledge, Tsayatoh ("Water Under the Rock") is a very old settlement. There are piles of stones here that Hudson said were left by the Diné making the Long Walk so they could find their way back if they ever got loose from Fort Sumner. But there were only a handful of families living here when Atsidi Biyé, in exchange for guiding a BIA survey crew, was awarded the sprawling allotment that eventually became known as "Hudson's Ranch," where his descendants still live. The ranch is named after the ever-industrious Tom Hudson, who fenced it and made many other improvements. The family's name was changed from Etcitty (a corruption of Atsidi) by Tom Hudson's co-workers on the Santa Fe Railroad. They thought it was funny, Walter Hudson explained, that Tom's middle name was the same as one of the names painted on the Delaware & Hudson boxcars. The drought has hit this ranching chapter hard Ñ even the Tsayatoh has dried up -- and the family has sold off most of its cattle. But it will never sell them all, Walter Hudson said, because they are very special cows: one of only three remaining herds on the reservation descended from Henry Chee Dodge's "high-hip Hereford" cattle. Tom Hudson was Dodge's nephew by marriage and obtained the cattle from him, he explained. There were two thriving trading posts in this area, one run by a man the Navajos knew as Diné Yeelini (Person Who Acts like a Navajo) and the other by Tl'izi Ch'oosh Chii, "Red-Bearded Billy Goat." So there wasn't much need to brave the 15 muddy miles to town in your wagon or rickety truck. But if there wasn't much interaction with the town as a whole, there was plenty of commerce with a few individual bilagáanas. You can see it in the exotic green or hazel eyes of some of the townsfolk. The Tsayatohans call it "trading post blood." "All the trading post men had Navajo mistresses," Hudson confided. You'll also see some darker-skinned folks here with "Elvis-like sideburns," Hudson said. They are descendants of a Spanish colony that moved here from El Morro and intermarried with the locals. "The light-skinned people, the dark-skinned people, we don't see them as any different," Hudson insisted. "We're all Navajos. When there's a squaw dance, we all show up. When there's a need in the community, everybody pitches in." There were also some bilagáanas who managed to obtain land in this heavily checker boarded community, most notably McKinley County's iconic deputy sheriff during the Depression era, Lawrence E. "Bobcat" Wilson. "Bobcat had an understanding with the elder Navajo men," Hudson recalled. "They let his livestock graze on their allotments and he would hire them on his ranch." Wilson had a beautiful stallion he rented out for stud fees. "Because of that stud, we have beautiful horses in Tsayatoh," Hudson said. "You won't see the regular Navajo grumbies here." The Tsayatohans are fiercely protective of their horses and voted against the recent feral horse roundups. 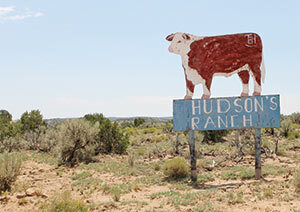 "We just don't really have feral horses here," Hudson explained. "Everybody knows whose horses they are, and if you see some coming toward you down the road, you just shoo them back to your neighbor's ranch." Ranching, the railroad and coal were the main occupations here for years and years. Even Bowman remembers when the row of hills you see along Highway 264 were studded with working draglines. And, although not to the extent of Black Mesa, there were relocatees. Hudson was a young chapter official when Pittsburgh & Midway Coal Mining Co. came in and started moving people out. They promised the Navajos compensation but the people were afraid they wouldn't get it. "I asked for help from some militant people, some AIM members in Denver," Hudson recalled. They referred him to attorney Paul Frye, "a young bilagáana guy still wet behind the ears," Hudson said, "and we started fighting the Pittsburgh Mining Company. That's how we got the PNM homes." The court ordered PNM to build 44 homes for displaced Navajos on 640 acres, still being lived in today. "About 10 years ago," said Hudson, after the land was reclaimed, "PNM came back and offered those families their grazing permits back. The families said, 'This grazing permit is a very argumental piece of paper. It causes division in families. We don't want it back.' So now those 14 grazing permits are null and void." Tsayatoh has come a long way since Atsidi Biyé called community meetings under a big pine tree. The chapter has set aside $1.8 million to replace the condemned 1974 chapter house. With frontage along both I-40 and Highway 264, Tsayatoh is in a great position to lure in business if it can untangle the checkerboarded rights-of-way. The chapter is in the process of getting certified, after which it may press its land claims against the community of Tsé Bonito and T& R Market so it can collect taxes on those lucrative establishments. "They say they're on private land, but I say they're on Executive Order land (within the boundaries of the original reservation)," Hudson said. Gallup-McKinley County School District is also planning a school in the area, although Tsé Bonito also wants it, Hudson said. The birthrate has been low for a while, but since the road to the chapter from 264 was paved, a lot of young families are moving in, said LeMaster. Bowman's considering it. He's a musician and has fantasies of establishing a recording business in Tsayatoh. "It's just a really nice place to live," he said. "Close to Gallup, but yet its own place."